Thanks to a chance meeting at Scarab, Wintertree has gotten space at GnomeCon at the last minute. They say it’s “funky” (that was really on the PayPal invoice!) so I’m not 100% sure what to expect, but so long as it’s got power and isn’t raining indoors (like one memorable GenCon) it’s all good. The listing of spells for TGR is much vaguer than the stats, monsters, and so on. There is a table that generates spellbooks, true, but it’s rather an old one, and all of the spells listed in it are just names I made up on the spot, expecting the user to fill in the appropriate spells for their game system and their campaign. A lot of TableMaster tables need some kind of spells. A trap might fire off something, a magical item could cast something else, and so on. This listing is, therefore, rather heavily skewed toward spells for those uses. TGR, natually, has a list of monsters. It might be one of the most important lists, actually, because so many TableMaster tables refer to various inimical beasts. 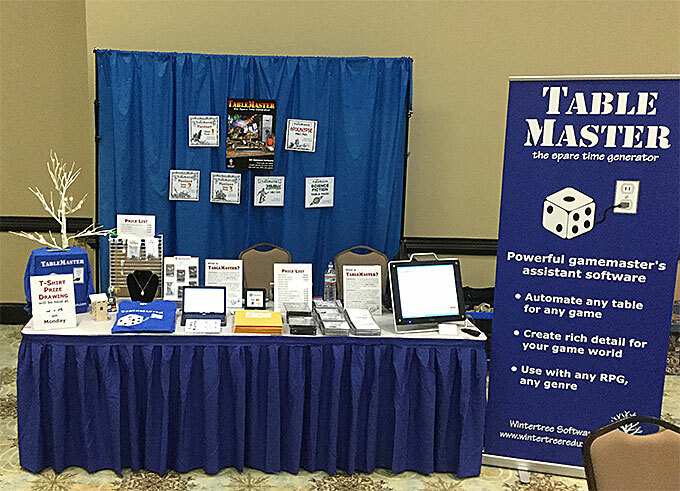 And, after all, the whole purpose of the TGR rules is to provide a framework for TableMaster results so you can convert them to your actual game system. TGR monsters are primarily from Greek/Roman mythology, with bits of Persian, Arabian, Egyptian, and a few others, thrown in. There will probably be a few more added later, too. In addition to the named monsters here, any ordinary creature might appear in natural, giant, or prehistoric forms: lions, giant lizards, and cave bears would be obvious examples. As described in yesterday’s post, Wintertree has a set of RPG rules. Unlike every other company’s rule set, though, this one isn’t intended to be actually playable; instead, it’s a framework for TableMaster tables to refer to, so that the user can more easily modify those tables for the actual game system he or she is running. Today’s post is about the character stats and how those work, to the extent that anything in TGR works at all, plus the basic races and classes. No, you can’t play it. Okay, let me explain: For many tables, it’s been necessary to refer to game stats of some sort, spells, effects, and so on. Given that I want the results to be usable with whatever game the user is running, and I don’t want to get sued by one of the more litigious companies (this was a particularly big hazard 20 years ago when some of them were first written) I’ve always just made something up as I went along. Whatever stats a given table referred to might not be the same as what I made up for a different one the next time I was writing one. It’s been a long four days. Scarab was only an hour away, so we commuted, and that takes a lot out of you. When you’ve got a car that gets nearly 40 mpg, though, it really saves on expenses, and I’m sure Caesar, being a cat, appreciated having his humans home to amuse him on request. Congratulations to Dennis Burgess, who won the Wintertree T-shirt drawing. Here’s a picture of the booth. It’s not a great picture because it’s just the camera on my iPod Touch; I kept forgetting to take a better camera. Then again, back in the day I used to use a Polaroid; this is definitely an improvement.